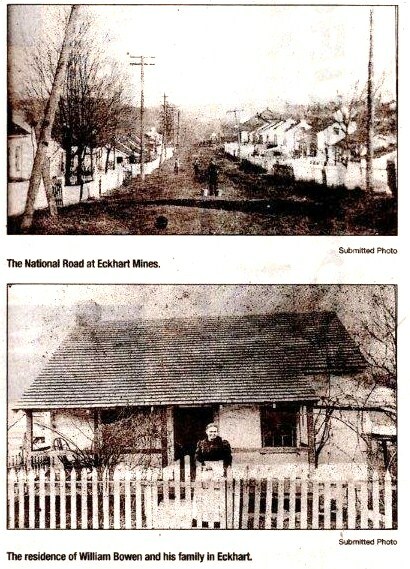 The Maryland Mining Company built the first of the company towns, Eckhart Mines, in about 1835. By 1852, seventy small stone cottages and log framed brick dwellings stood around the mine openings. Some of the cottages can still be seen today, much as they looked in 1852. William Bowen, born in England, left his homeland about 1846 and came to America, the land of opportunity. William and his wife, Eliza, settled in the little town of Eckhart with their two little girls. About a year later their first son was born and they named him Benjamin. William and Eliza went on to have 10 more children, four girls and six boys. Quickly their family numbered 15. By 1870 William and sons Benjamin, 23; Thomas, 17; and James, 15 were working in the coal mines in Eckhart. At that time, it took four workers to feed a family of fifteen. However, Benjamin had fallen in love and in 1875 was married to Laura Fuller and soon had three children of his own.